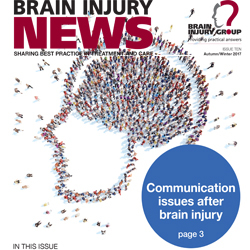 Home > News & press releases > Brain Injury News – the communication issue – available now! Issue 10 of Brain Injury News has now been published on our website. The focus of this issue is communication, that fundamental behaviour – whether verbal or non-verbal – that sits behind how we express our thoughts and personalities, how we make decisions and how we build relationships. 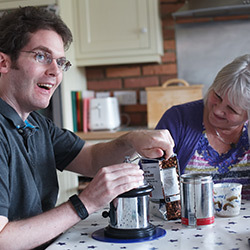 Brain injury nearly always results in cognitive issues and communication challenges and our contributors look at the impact of problems relating to speech, language and communication on individuals and families, and how they can best be supported. Our thanks to Lisa Harris of Re:Cognition Health for her insights borne of decades of experience as a speech, language and cognitive therapist. We also have a contribution from renowned music therapist Daniel Thomas of Chroma who look at how arts-based therapies are joining the more ‘mainstream’ therapies to aid communication. Of course communication and understanding are two very different concepts, and Tim Farmer, one of the UK’s leading assessors of capacity, provides his own unique take on how to differentiate between the two, and how to help people to have their voice heard. Helen Ovans of ILS looks at the vital communication role of a case manager to help drive rehabilitation, and Julia Hurlbut of Jackson Lees describes how considered communication strategies help to maintain health long term client relationships with individuals and families involved in pursuing personal injury claims. The impact of technology of an individual’s ability to communicate cannot be underestimated, and Mick Davies of Liberator UK takes an inevitably brief overview of how alternative and augmentative communication tools can help people with communication disorders. Copies of all previous editions of Brain Injury News can be downloaded from our website here.